Propagation of a narrow-band three-frequency finite amplitude wave (wavepacket) with a symmetric frequency spectrum and arbitrary ratio of initial amplitudes and phases is studied experimentally. It is shown, that at propagation in fresh water every Fourier-component of a wavepacket gets the additional phase incursion caused by nonlinear interaction between them. Dispersive characteristics: changes of different harmonics phase speeds, group speed of a wavepacket and dispersive parameter are calculated from the obtained relationships. It is found, that occurrence of a nonlinear dispersion directly depends on amount of three-frequency wave phase invariant, which is a linear combination of initial phases of harmonic waves in a wavepacket. It is shown, that change of phase invariant may affect both on size and on sign of dispersion. Conditions when it is possible to exclude dispersion are examined. Experimental setup, method and measurement conditions for study of nonlinear phase incursions are considered. The qualitative agreement of computed and experimental results is obtained. Сitation: A. M. Gavrilov, R. O. Sitnikov. Nonlinear dispersion of a three-frequency wave packet in nondispersive quadratically-nonlinear medium. Experiment. Electronic Journal “Technical Acoustics”, http://www.ejta.org, 2005, 29. 2. Виноградова М. Б., Руденко О. В., Сухоруков А. П. Теория волн. М., Наука, 1990, 432 с. 3. Новиков Б. К., Руденко О. В., Тимошенко В. И. Нелинейная гидроакустика. Л., Судостроение, 1981, 264 с. 4. Гаврилов А. М. Нелинейная дисперсия трехчастотного волнового пакета в бездисперсионной квадратично-нелинейной среде. Теория. 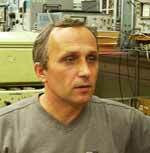 Электронный журнал «Техническая акустика», http://ejta.org, 2005, 28. 5. Гаврилов А. М., Медведев В. Ю. О влиянии амплитудно-фазового спектра на нелинейное распространение трехчастотной волны. Труды ХIII сессии Российского акустического общества, т. 1. М., ГЕОС, 2003, с. 130 – 133. 6. Зверев В. А. Модуляционный метод измерения дисперсии ультразвука. Акуст. ж., 1956, т. 2, № 2, с. 142 – 145. 7. Гаврилов А. М. Зависимость характеристик параметрической антенны от фазовых соотношений в спектре накачки. Акуст. ж., 1994, т. 40, № 2. с. 235 – 239. 8. Горелик Г. С. Колебания и волны. М., Госиздат физ.-мат. литературы, 1959. 572 с. 9. Карлов Н. В., Кириченко Н. А. Колебания, волны, структуры. М., Физматлит, 2003. 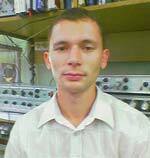 496 с.
Roman Olegovich Sitnikov - рost-graduate student at the Department of acoustics and medical technology, Taganrog State University Of Radioengineering.